A floral life extender packet is typically included with your floral delivery, it is basically sugar that helps keep the bacteria count in the water low. An aspirin, (not ibuprofen), works just a well. Aspirin seems to lengthen the life of the flowers. Just be sure to snip a bit off the ends of the flowers each day. Keep the vase, container or liner filled with fresh water. Even if the container has floral foam, you should keep the water level high to promote long lasting flowers. The container's water has a fresh flower food added to it. If you completely change the water, you should also thoroughly clean the container. Add fresh water mixed with a commercial fresh flower food. These flower foods may be supplied by the florist who delivered your order and they contain the correct ingredients to properly nourish the flowers, keep bacteria at bay (which can block the stems and prevent them from absorbing water), encourage buds to open, and lengthen the life of the bouquet. It's one of the best—and easiest—ways to extend the life of your flowers, but be sure to follow the directions on the package correctly. Improperly mixed flower food can actually do more harm than good. The same general care guidelines described above apply to anemone, but because their stems are very soft and easily damaged, handle them gently and support their stems when re-cutting. The delicate nature of the blossoms means you'll enjoy them for 3-5 days. Each stem of a bird of paradise usually contains about 4 to 5 flowers (called inflorescence). Sometimes only one flower is visible, where others are hidden in another part of the flower. When one exposed flower withers it should be removed and another one can be pulled out of the flower's boat shaped bract. If a flower doesn't emerge, gently ease it out by hand. These exotic blooms are sensitive to temperatures below 50 degrees F, so display them in a warm spot. The same general care guidelines apply to callas but because their spathe (the colored part of the flower) can bruise easily, it's important to be particularly gentle when handling them. Callas have thick fleshy stems that tend to curl at the bottom as they age. They should be recut every 2 days for maximum vase life. They tend to be thirsty flowers, so check the water level of your vase often. The same general care guidelines described above apply to carnations, including their sensitivity to ethylene, a harmless (note: it does not harm humans or animals), naturally produced gas, which can be released by fruits, vegetables, and decaying floral materials. Keep arranged carnations free of ethylene producing materials for best results. When you re-cut the stems, cut them just above one of the nodes that run up the flower's stalk. This will allow the stem to more easily draw the water it needs. When properly cared for carnations can last 7-14 days, depending on variety. 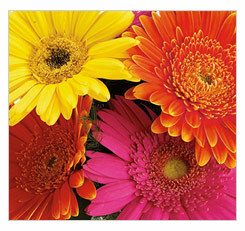 Chrysanthemums come in a wide variety of colors, shapes and petal formations. Some even look like the most exotic blossoms you've ever seen – in unusual colors with single or multiple blossoms per stem. It's important to remove the foliage of chrysanthemums if it begins to droop or yellow. The foliage often deteriorates more quickly than the flowers themselves. Recutting the stems often will also increase the uptake of water and increase vase life. Most chrysanthemums will last 7 to 12 days on average. Follow the general care guidelines described above for your roses, being sure to remove any discolored petals on the flower's outer edge (called guard petals) and foliage that fall below the waterline when refreshing your arrangement. Recutting the stems often will give your roses the longest vase life.